Oscillatory (OC) training is implemented throughout the Triphasic Training Method (Hex Bar DL OC Example, DB Bench Press OC Example, DB Bulgarian OC Example). However, based on questions received through email, this training strategy is one of the least understood in regards to its use within a program model. To the untrained eye, these brief, 3-4 inch movements applied with well-trained athletes, can appear as gimmicky and useless, this could not be further from the truth. In all reality the OC methods utilized are able to improve strength within specific movement ranges, increase motor learning of skills, lead to further adaptations in the three muscle actions required in all dynamic movements, while also training specific joint ranges of motion required in the sport being trained for. The reasoning, as well as the specific implementation strategies, including both the execution and timing, OC will be covered to a great extent within this piece. OC training methods involve a rapid “push-pull” motion in an attempt to maximize the ability of an athlete to reverse the muscle action phase at a high-velocity. In Russia there was originally a 5 level organizational system based on the ability of an athlete. Level 1 was a beginner while level 5 represented the elite athlete, the athlete that is viewed as the best in their respective sport. It is shown in Russian literature that the separation between a level 4, or advanced athlete, and a level 5, or truly elite athlete is not the ability to contract their muscles at a high rate (although this is a requirement of both levels), but rather the ability relax their antagonist muscles at a high-velocity. Consider level 4 to represent an average NBA athlete, highly skilled in their sport, while level 5 represents a Michael Jordan caliber athlete. Although there are many factors to consider in team sports, in the 5 level system the major difference between these athletes is to relax their antagonist (or opposing) muscles in a movement. This ability to contract and then relax muscles at the highest speeds represents the skill of rapid change of direction in the muscle required in all dynamic movements. A bicep curl is a simple example that follows this contraction and relaxation idea, coined “Sherrington’s Law of Reciprocal Inhibition”. During a bicep curl (elbow flexion) it is clear and common knowledge that the bicep is shortening. However, the tricep must also allow lengthening for the elbow to complete flexion. If the tricep does not relax in a rapid enough fashion, whether that be due to a lack of strength or motor pattern, the bicep is not capable of producing the maximal level of force possible. As a high-velocity setting is experienced, such as those seen in athletic competition, the slower relaxation of the tricep will cause even greater difficulties as the speed of elbow flexion will be greatly reduced. Although this is an over-simplified, single-joint example, the same contraction and relaxation rules apply within all movements. It is the ability to control this task of rapid contraction/relaxation in the “push-pull” mentality that separates the elite from the advanced level athletes. The OC methods are designed to increase the ability of the musculature to complete this task once an athlete has been trained appropriately. As described above, an advanced athlete will be capable of completing these high-intensity movements in a 3-4 inch range. This is due to their increased ability to contract and relax the agonist and antagonist muscles respectively. A less advanced athlete may require a range of 5-7 inches in OC movements as they are unable to reverse the muscle action phase, or contract and relax their muscles in the maximal velocity setting. This ability is crucial for all athletic competitions requiring high-velocity movements, which occur in almost every sport. At this time it is well understood that strength levels vary throughout the range of even the simplest movements. A true one rep max for any exercise simply represents the strength available at the weakest point of that movement. Every coach understands the sticking point in a bench press, or getting pinned at the bottom of a heavy squat rep. In a max out bench press, the true one rep max represents the strength of an individual at their sticking point. When using 80% of a one rep max, the athlete may experience the load as the true 80% through that sticking (weakest) point, but may then only experience that same load as 60% in the upper range. This can be seen in the bar speed change based on the range of motion being trained. It is for this reason exercises such as 2-board bench, accommodating resistance, as well as other variations of the lift, have been implemented. Simply because an athlete is much stronger in those higher positions of the bench press. If the sticking point strength is trained and improved in a movement the strength levels will be increased dramatically. This methodology can be applied to any exercise completed in a training program to improve strength levels. OC methods can be completed in training to create high forces, intensities, and volume in the weaker positions of every exercise to improve strength. By placing athletes around their sticking point of any exercise and then forcing the creation of movement against high loads of force requires strength in these specific “weak” points, while also reducing the energy expended in the already strong points. For example, if the bench press is trained at 80% of correct one rep max an athlete will be able to complete, on average, 3 sets of 4-5 reps. However, when training with the OC method, an athlete is able to complete 3 sets of 8-10 repetitions in the weaker position. This allows less energy to be wasted in the upper ranges of movement, where the athlete is already strong and only experiences the load as only 60% of a one rep max and then forces emphasis upon the weaker position, where they must endure the true 80% strength improving load. The intensity of an exercise is drastically increased if an athlete is required to spend a duration of time in a range of motion that is commonly considered to be weaker. Referring to the bench press example above, if the entire range of motion is utilized, the percentage of the athlete’s one rep max at each degree of movement varies to a great extent. Near extension the athlete will be considerably stronger than at the bottom position. If, instead of a full rep, an OC movement is implemented in just the weakest point the intensity is increased dramatically as the entirety of the set is spent in a difficult position. This training approach not only increases the intensity of a movement, but also leads to an adaptation of the golgi tendon organs (GTO’s). GTO’s act as neuromuscular inhibitors and are sensitive to the forces developed within the muscle. If muscle tension increases sharply, which is common in the realm of athletics, the GTO reflex responds. This response leads to an inhibition of muscle action, ultimately decreasing tension to prevent the muscle and/or tendon from incurring damage due to the rapid, high levels of force. Every GTO is set to a specific, trainable, activation threshold. Think of this activation threshold as a governor on a truck. It is in place to ensure the safety of the structure and reduce the likelihood of injury. In general, the majority of GTO’s are pre-set to inhibit a muscle up to 40% below what that structure can actually handle. For example, if a muscle structure is capable of handling 100 lbs of exerted force, the GTO system would reach its activation threshold at 60 lbs of force. This leaves 40 lbs of untapped performance potential. Through appropriate training of the weaker points within range of motion the activation level of GTO’s can be elevated, as the body adapts and is taught to handle higher loads in specific ranges of motion. Ultimately, the ability to reduce the activation of GTO’s at high force levels will lead to increased force output from the muscle and improve strength. The OC training methods can be further implemented to increase the motor learning of movements as well the development of tissue tolerance. Every movement ever executed by any person is the result of a highly specific skill learning process. All skill learning is a result of the nervous system sending a signal to the utilized motor units in any movement. As an athlete completes a movement continuously, the signals sent in that pattern summate and the body “learns” to complete these skills in a highly efficient manner. Through the use of OC methods the total number of signals sent in a position are maximized in the “push-pull” execution of a movement as high-forces are applied leading to increased motor unit recruitment. By completing exercises in a condensed range of motion, tissue tolerance to high-forces is further enhanced and can lead to a reduction in injury likelihood at that tissue length. It is important that all performance coaches understand the positions in which athletes have an increased likelihood of sustaining an injury and utilize training within these ranges of motion effectively. When using OC movements, athletes not only learn skills more quickly and efficiently, but they also improve their tissue tolerance to stress in specific ranges of motion. Although the improvement of strength and tissue tolerance are important precursors in athletic development, OC training serves a much more specific purpose in a performance program designed to maximize athletic performance. Before the implementation of OC methods, every coach must understand the reasoning behind these rapid, partial exercises requiring high nervous system activity and muscle action based movement. This method of exercise implementation is designed to enhance the training adaptations already in place and should be programmed accordingly. Based on the understanding that the three muscle actions (eccentric, isometric, and concentric) and required in every dynamic movement completed, the importance of training each of these muscle action phases to the fullest extent becomes well understood in performance improvement. The idea of training each muscle action phase individually forms one of the pillars of Triphasic Training. The adaptations which occur within each muscle action training block are explained with the hyperlinks (Eccentric & Isometric). When these adaptations caused by the training of the eccentric and isometric phases are realized and maximized, every athlete will have the capability to produce high force movements with increased efficiency. Although these adaptations are vital for optimal performance, the slow “controlled” training completed during both of these training phases are not specific to the high-velocity requirements in sport. As discussed in the opening paragraph of this article, truly elite level athletes (the Michael Jordan’s of the world) are capable of their feats partially based on their ability to relax their opposing muscles at a higher rate than others. This results in an extremely rapid change of direction within the individual muscle, as it transitions from eccentric through concentric actions, and vice versa. The Triphasic Training Model exploits and trains this skill specifically through the use of muscle action and OC training methods. With the understanding that the three muscle actions not only occur, but are realized at extremely high-velocities and at specific joint angles in athletics, the OC training methods can be implemented to meet the exact requirements of any sport. The small OC training movements utilize each of the three muscle action phases with a “push-pull” mentality. By training with this “push-pull” mentality, OC movements are able to create the high-velocity, immediate muscle action changes required in virtually all athletic events. This is an important cue for all coaches to remember when implementing OC exercises, as it is easy for athletes to fall into the trap of not moving at high speeds. It is the intent, or the “push-pull” that all athletes must utilize, that creates the specific adaptations of the OC method. The difference between a triphasic trained athlete and one not trained in the muscle action phases is visible when the rapid shift from eccentric to isometric and finally to concentric muscle actions is required (force production differences between elite and advanced athletes in Figure 2 below). The OC method is designed to expose this weakness in a high-velocity setting. When previous training has been completed appropriately, the ability to reverse the direction of the training implement is maximized. Ultimately, the goal of OC methods are to train the athlete to accelerate and decelerate their body in as rapid of a fashion as possible, which is the most sport specific trainable skill. This skill enhancement results in a continued improvement of the transition from lengthening to shortening in the trained muscle and increased efficiency of the stretch-shortening cycle. Training specificity through the use of OC methods can be enhanced through the use of specific joint angles required within sport. With the understanding that the goal of OC training is to increase the ability of the muscle to transition from a lengthening to shortening muscle action as rapidly as possible, training must be completed within the specific ranges these transitions occur in the athletic event. This specificity of movement allows for maximized transfer of training from weight room to the athletic competition. For example, in a movement such as running the top of the knee drive requires a rapid conversion from hip flexion to hip extension. As the knee approaches the maximum height of its path, the hip extensors eccentrically load. If this were not the case the leg would never slow down and reverse its direction. By training with the use of OC movements in the knee flexed position (similar to the height of knee drive in running), the ability to overcome the forces created during high-velocity hip flexion in a rapid fashion are maximized. As discussed earlier OC methods can be implemented in order to improve strength in “weak” or sticking points, leading to the overall enhancement of strength created in a movement. However, this training method can also serve to increase neural drive for rate of force development and improve the maximal velocity of actions completed. Each of these specific adaptations depends on whether the OC movement is executed in the disadvantageous (weakest) or advantageous (strongest) position. Each of these possible positions are self-explanatory based on the executed movement, with disadvantageous referring to the “weaker” position and advantageous relating to the stronger position. Referring back to the bench press example, the disadvantageous position would be located around the sticking point, where the athlete experiences the load as a higher percentage (as they are weaker). 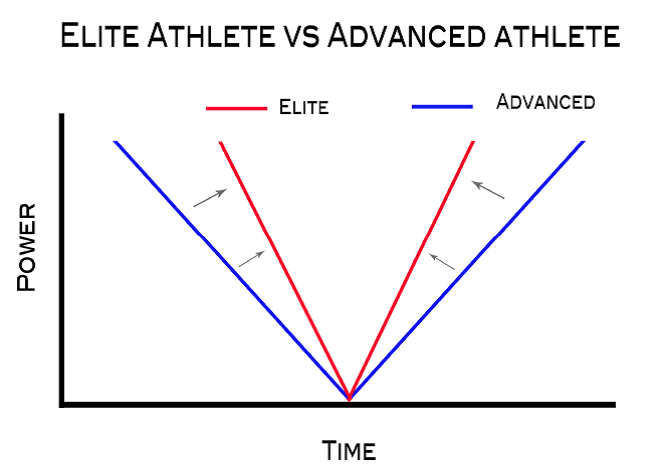 The advantageous position would be at the more extended positions as the athlete is stronger in these positions. By training each of these positions individually, the ability to drive specific adaptations is improved to the fullest extent. Notice when describing these two positions I did not say the disadvantageous positions creates “higher stress”. 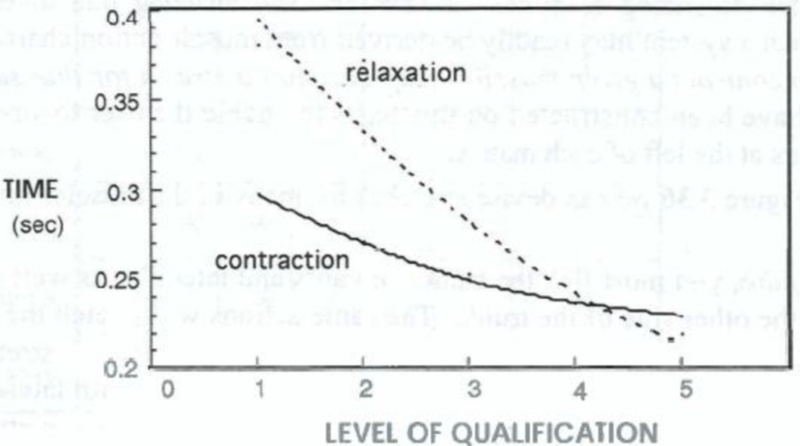 It is important to understand each of these methods create high levels of high-quality stress when applied correctly. However, different adaptations are stressed individually based on the position selected. If increasing strength is the goal of the training block then the disadvantageous position would be utilized. Currently, this position is utilized within the reactive days of the strength block to maximize intensity and strength improvements. On the opposite end of the spectrum, OC methods in the advantageous position can be implemented to maximize neural drive and maximal contraction speed, as the athlete is “stronger” in this position, these would be utilized during the speed training block. The loads implemented within the OC method, as well as the positions selected, continue to follow the block training philosophy utilized within the Triphasic Training Model. The block training model implemented trains the skill of tissue tolerance (energy system and GPP training) and strength (high-loads and specific muscle action training) early in the training cycle and then transitions to skills such as power and speed (through the use of low-loads and high-velocities) as the competition date approaches. Tissue tolerance is created through the use of 30 second OC work in the second GPP training block “GPP Block 2 30 Second Isometric”. In this phase the athlete is introduced to the OC methods through a moderate intensity and increased volume. It is through this increased volume within this block strength and skill learning within specific ranges of motion takes place, while also maximizing the metabolic requirements of this second GPP block. In the strength and power blocks, OC movements are completed with high loads (above 80%) and are implemented on the reactive day within the training block (Day 2 of a 3-Day Training Block). OC methods should be completed within the disadvantageous, or weaker, positions to ensure the goal adaptation of improving strength is maximized within the block. With the goal of maximizing neural drive in the speed phase the advantageous position can be utilized, however that is not always the case. It is important that all coaches understand the requirements of the sport being trained for when implementing OC methods. Taking football for example, a lineman requires much more strength (as they push against another strong force) than a wide receiver. That being said, a disadvantageous OC method would be implemented for the lineman’s training while an advantageous OC can be applied. These considerations should all play a role in the development of a program implementing OC training methods, particularly in the speed block. Clearly OC training can be utilized within a training program for multiple reasons in order to increase the stress experienced by the body and drive specific adaptations. A performance coach must always remember there is no such thing as a perfect exercise, just perfect methods to implement an exercise. The OC method allows for a coach to determine the needs of their athletes, all based on the goal of the training block. If an athlete requires increased strength levels the disadvantageous position can be implemented. Motor learning and tissue tolerance can also be enhanced based on the use of OC training. Finally, the rapid transition from muscle lengthening to shortening can be maximized at specific joint angles required in competition when OC methods are applied appropriately. Each of these skills play a vital role in performance and must be trained appropriately. More examples of OC exercises can be located on the exercises tab of XLAthlete.com.